Pump prices in the West Coast region are the highest in the nation, with all of the region’s states landing on the nation’s top 10 most expensive list. California ($3.80) and Hawaii ($3.51) are the most expensive markets. 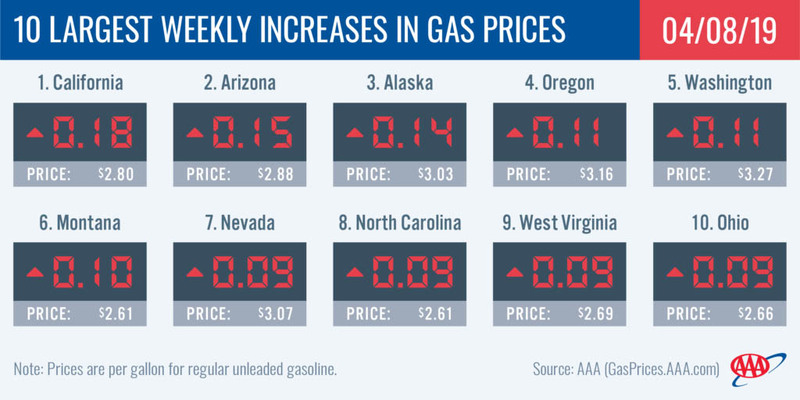 Washington ($3.27), Oregon ($3.16), Nevada ($3.07), Alaska ($3.03) and Arizona ($2.88) follow. All prices in the region have increased on the week, with California (+18 cents) and Arizona (+15 cents) seeing the largest increases in the region and country. [320left]The Energy Information Administration’s (EIA) recent weekly report, for the week ending on March 29, showed that West Coast gasoline stocks fell slightly by 70,000 bbl from the previous week and now sit at 30.96 million bbl. Ongoing planned and unplanned refinery maintenance throughout the region, including at Valero’s 149,000-b/d refinery in Benicia, CA, have reduced stock levels in the region amid reports of HollyFrontier’s 100,000-b/d Navajo Refinery in New Mexico contributing to gasoline shortages in Arizona. Stocks are approximately 1.5 million bbl lower than this time last year and could fall further this week depending on refinery maintenance turnaround. Gas prices in the region range from $2.50 to $2.88. 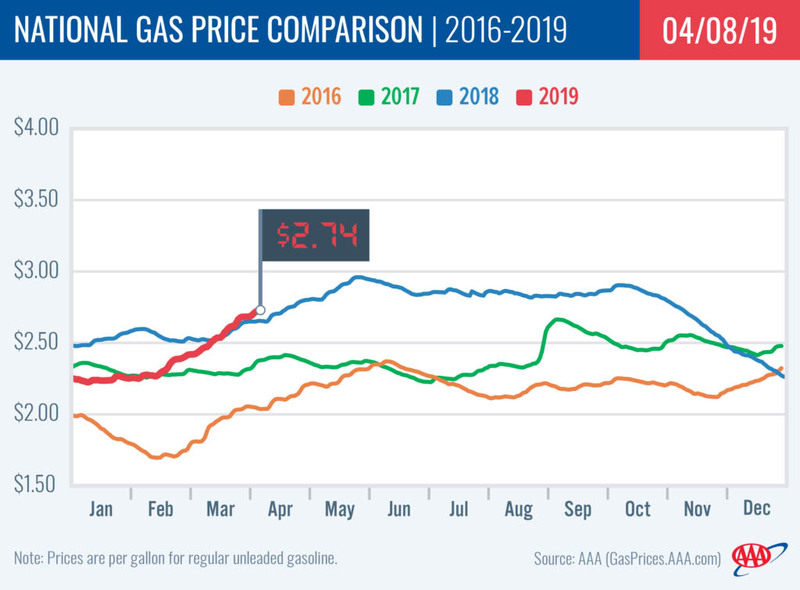 Among the Mid-Atlantic and Northeast states, three carry gas prices that are a quarter or less from hitting the $3.00/mark and rank among the top 15 states with the largest averages today: Pennsylvania ($2.88), Washington, D.C. ($2.86) and New York ($2.76). At $2.74, Connecticut is trending this way too. [320right]Gasoline stocks drew just under 1 million bbl, according to EIA’s latest report. Levels measure at 63.5 million bbl, which is a 6 million bbl year-over-year surplus. That stock number has the potential to grow considering regional refinery utilization has been steadily rising since the beginning of March, jumping from 67.7% to 79%. However, should spring and summer demand rapidly increase, stock levels would chip away at the surplus and would likely cause more expensive pump prices. The latest EIA report shows stocks have steadily declined since mid-February in the region. With the latest 1 million bbl draw, stock levels have dropped to a new low for the year at 53.8 million bbl. Furthermore, EIA reports regional refinery utilization for the week ending March 29th is down three percentage points from the week prior. This could cause stocks to decrease even further in next week’s report and has the potential to cause jumps at the pump in coming weeks. The South and Southeast region was the only one to see gasoline stocks build on the week with the addition of 605,000 bbl. The increase pushes total stock levels just above the 81 million bbl mark. Stocks will likely decrease in spring and summer due to demand, pushing pump prices higher. [320right]At the close of Friday’s formal trading session on the NYMEX, WTI increased 98 cents to settle at $63.08. Oil prices climbed last week following strong U.S. economic data that reduced fears of a drop in global crude demand later this year. Moreover, escalating military actions in Libya – a major global crude producer and exporter – supported crude price increases amid concerns that crude exports from the country could be affected by the tension. Oil prices could climb even further this week as OPEC’s 1.2 million b/d production reduction agreement remains in place through June and the U.S. tightens its crude export sanctions against Iran and Venezuela.